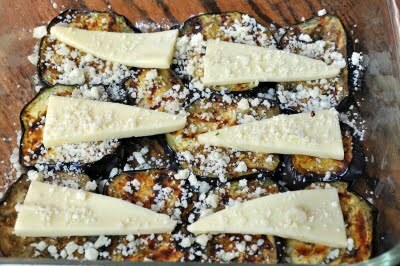 I’m not a huge eggplant fan so it’s always a challenge for me to find ways to cook it that disguise the flavor sufficiently to make it palatable. As I was staring at these lovely beauties today I had a vague memory of a really light and fresh version of an eggplant parmigiana dish I had in Casperia, Italy a few years ago. 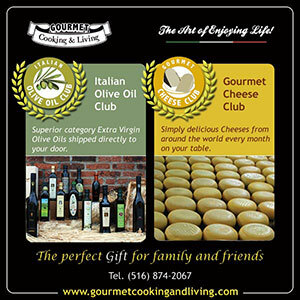 The young chef, Jenny Scheda, layered grilled eggplant with fresh cherry tomatoes, basil and mozzarella cheese in individual tarts and baked them for a wonderful first course. 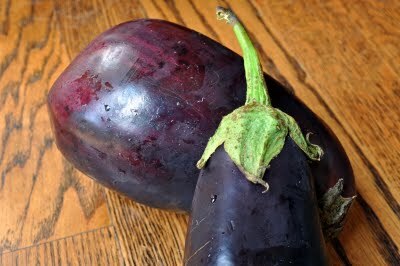 So I set out to make something light and began by slicing these eggplants into half inch thick slices. 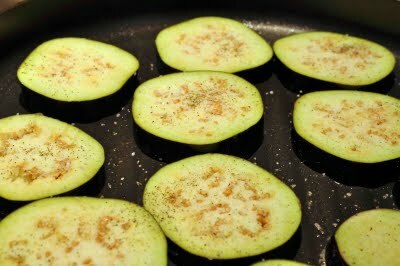 I placed them into a nonstick grill pan, spraying each side with cooking spray and seasoning them with salt and pepper. 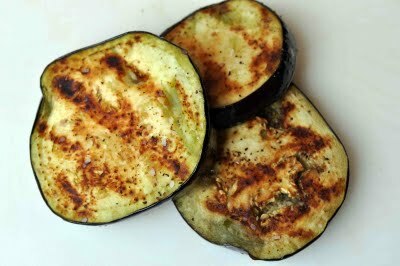 BTW, the reason I used cooking spray is that eggplant is so spongy and absorbent, that I was concerned if I drizzled them with olive oil they would just soak up too much oil and I was trying to keep it light. Take them out of the pan when they are slightly soft and have good color like this, then repeat with the remaining slices until they are all cooked. …and finally a small layer of marinara sauce. Now if you look closely at my sauce, you’ll notice chunks of something in the sauce. 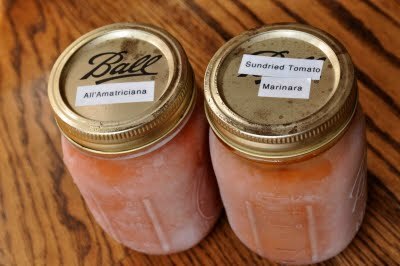 Turns out when I was cleaning out the freezer to give my daughter jam this weekend I found two of the homemade sauces I made last year and somehow missed this winter. I selected the All’Amatriciana sauce because it has delightful crispy pieces of pancetta in the sauce, which I adore. If you want to keep this vegetarian, use a vegetarian marinara sauce. If you like meat, you can add browned ground beef or sausage to the layers like you would in a meat lasagna. 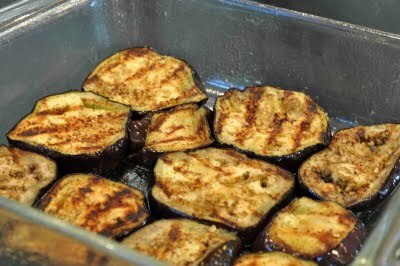 Heat a large grill pan over medium high heat and add eggplant slices. Spray each side with cooking spray and sprinkle with salt and pepper. Grill, turning occasionally, until golden brown grill marks appear on both sides. Remove to a platter and repeat with remaining slices. 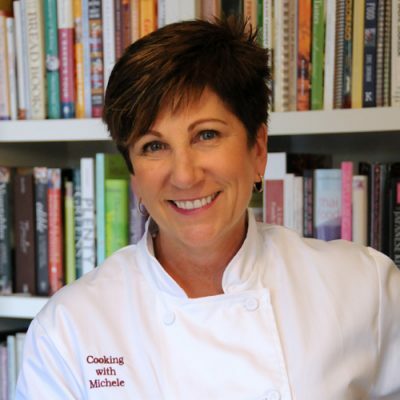 Spray an 8-inch square baking dish with cooking spray. 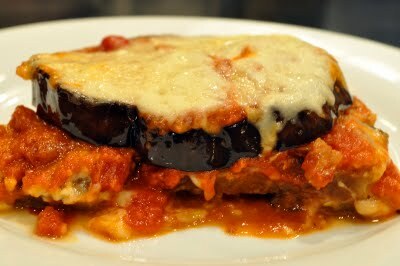 Place a single layer of grilled eggplant slices on the bottom, layer with 1/3 of the fontina cheese and 2 tablespoons of the Parmesan cheese, then pour 1/3 of the sauce over the top. 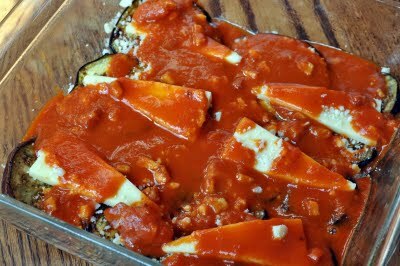 Repeat with two more layers, but on the top layer, place the fontina cheese on last. Cover with foil and bake at 350 degrees until bubbly, about 45 minutes. Let stand 10 minutes before slicing.